Home / Products / Seasonal / Easter Candies & Pops / Assorted Fruit Jelly Beans, 1 lb. 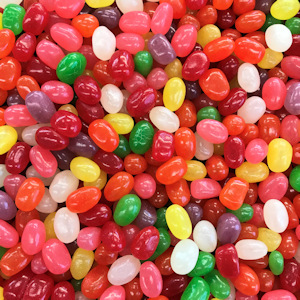 Assorted Fruit Jelly Beans, 1 lb. Fruit flavored jelly beans are packed with mouth-watering flavor for a yummy experience: orange, grape, cherry, pineapple, strawberry, lemon, lime and licorice. Sugar, Corn Syrup. Modified Food Starch, Contains Less Than .5% of the following: Sodium Citrate, Confectioners Glaze, Pectin, Natural & Artificial Flavors, Citric Acid, Carnauba Wax, Red # 40, Yellow # 5 (Tartrazine), Red # 3, Blue # 1.